This is not my dish, but it looked just like this. I bought a gammon from Iceland for the Christmas festivities – it was … OK, but not great, and very salty, so it languished in the fridge. There was also half a chunk of Gruyere, as I had done dauphinoise potatoes with the Christmas lunch, and some cream. So last night, Pete sliced potatoes very thinly on the mandolin (which terrifies me, so I make him do it), while I chopped red onion, tackled the Gruyere with a potato peeler (easier than grating for this sort of thing), and diced up leftover gammon. 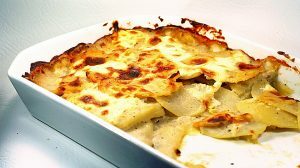 Into a nice cast iron dish went a layer of spud, then onion, gammon, garlic powder, black pepper, Gruyere and some cream. We added another layer of spud, more cheese (always moar! cheese! ), more cream, and a sprinkling of rosemary. Bunged in the oven for an hour, and readers – it was gorgeous. And there was enough left for lunch today, accompanied by home made lentil/veg soup. We had it with brussels sprouts (don’t care – we love ’em), mixed with olive oil, sea salt and black pepper, and roasted in the oven. De-li-cious.